Earlier this summer Miriam Bale asked if I might contribute to a weeklong compendium of comedy criticism under the title Comedy v. Criticism—this leading towards a screening of Elaine May’s film Ishtar at DCTV in New York on August 31st. (Richard Brody’s blurb on it here.) Miriam and I have talked about May for years, and this seemed a good moment to say something more. Knowing that Jill Dawsey had also done some thinking about comedy—at the end of Rachel Harrison’s lecture at SFMOMA in 2004, she screened a section of Blazing Saddles (1976)—I asked her to talk through May’s career with me. 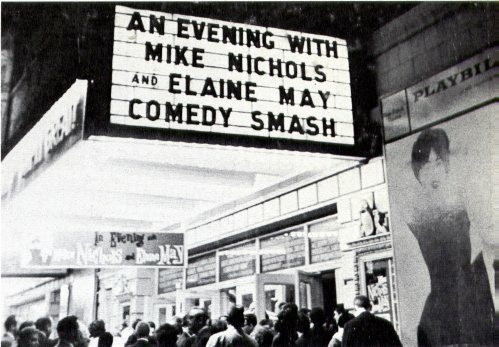 We watched Ishtar and The Heartbreak Kid, listened to recordings of her comedy duo with Mike Nichols, and read some reviews—in particular, a few by Pauline Kael. What follows is our exchange. Jill is Curator of Modern and Contemporary Art at the Utah Museum of Fine Art; from 2003-2006 she was curatorial associate in Painting and Sculpture at SFMOMA. 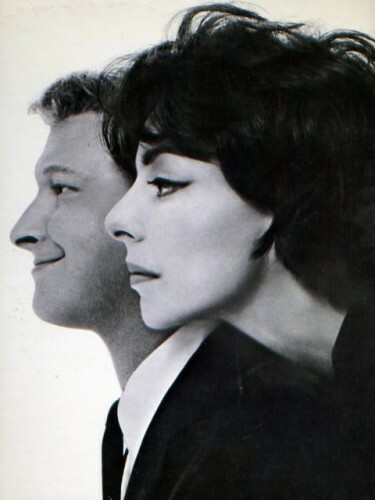 Richard Avedon, Mike Nichols and Elaine May, 1960. From the back cover of An Evening with Mike Nichols and Elaine May, Mercury Records 1960. JD: I am wondering about this. Kael seems primarily to oppose revue-style comedy because it relies so heavily on nuances of tone, of voice, and rhythm: things that don’t translate well to the big screen. So is this an issue of medium specificity: that the filmic close-up gives us the nuances of the face, but the nuances of voice are best conveyed on stage or record? JD: I understand this, yes. Montage is about condensing time, whereas part of what is compelling about Nichols and May are all the extra pauses and gaps. Kael’s references to Harold Pinter make sense in this context. JM: Does this change in May’s films? Ishtar has these great yawning, empty passages, where nothing much is going on—though somehow I’m still entertained. JD: I loved Ishtar, but even so I found it both chaotic and tedious. There are, as you say, empty passages—like the desert itself, one of the film’s settings and motifs—in which you find yourself quite bored. At the same time there is a very hectic quality to some of the editing. JM: Whenever they turn to music the edits get clipped and abbreviated. Almost as if to lampoon their style of schmaltzy cabaret act by filming it in a frantic manner. The songs are actually a slightly different brand of schmaltz (interesting that both kitsch and schmaltz are Yiddish terms). Paul Williams, with whom May wrote these songs, is something like a 70s Max Martin or Linda Perry. He wrote “Rainy Days and Mondays,” and “The Rainbow Connection.” Which is to say that he’d perfected a certain kind of massive, ultra-memorable sentimental pop, which puts a bizarre spin on the songs in Ishtar. He and May obviously worked overtime to write songs that are unbearable. JD: Another Carpenters song plays a vital role in The Heartbreak Kid: a brilliant, ironic use of “Close To You.” Having watched Ishtar last night, their song “Dangerous Business” is stuck in my head, despite how awful it is. JM: The songs are atrocious but they’re earworms. So, I have a theory about why critics found Ishtar so intolerable. It has to do with Top Gun, in whose wake Ishtar is meant to be a blockbuster, and Ishtar is among other things a military espionage film with requisite 1980s missiles and helicopters. And of course Top Gun was populated by these new, healthy, phallic, charged military characters. And here are Beatty and Hoffman, these big stars, are playing talentless schmucks (here’s more Yiddish—and indeed there is a hysterical riff in Ishtar on the word ‘schmuck,’ which Beatty’s character, like Beatty a gentile, can’t pronounce properly). It drove people crazy. JD: Of course we read several of the excoriating reviews of the film. I had to laugh when the review from the Washington Post complained that Beatty had “emasculated” himself. Whereas that was what I liked about his performance! It was just right (because it was wrong) for the Reagan 80s, as you are suggesting. JD: And then they are in each other’s arms. That is a brilliant moment. And you know, it does take a lot of nerve. That’s a true thing. JM: It’s true, but its also very funny and puzzling. What kind of a pep talk is this? And are their values being made fun of, advocated, or what? It backhands its own backhandedness. JD: This is the existential dilemma of the film: why should you go on if you are totally mediocre? Well, at least we can be mediocre together. Somehow this made a lot of sense to me. I also think of the moment when the camel won’t move. JM: Janet Maslin singles out this moment in her New York Times review. ”He’d rather just sit there, than move when you ask him; he’d rather get shot!” Mr. Hoffman cries in exasperation… ”Actually, I kind of admire that,” says Mr. Beatty. Mr. Hoffman considers that for a moment, then acknowledges, ”Me, too.” It’s oddly valorized. JD: Other critics hated this though. JM: Maybe it is frustrating because it’s half-allegorical. This camel has a toothache; it seems Hollywood-symbolic, but then it doesn’t achieve its “proper” meaning. And this is what is funny. JD: Does the Isabelle Adjani character function in a similar, if less funny way? JM: She is more a device than a symbol. Didn’t one review complain because her clothes were loose fitting? She’s beautiful, and it’s the 80s, so she should wear something more revealing. JD: She’s always in drag, actually – although this enables some adolescent jokes involving her breasts. 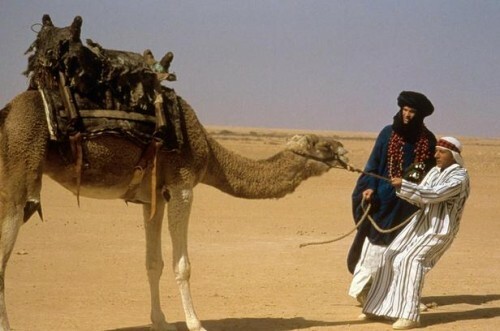 Adjani is half Algerian, and she discussed it publicly—not that she was ever hiding it—not long before Ishtar was made. So that even though, to Americans, she is a French movie star, her Algerian identity allows her to stand in for Ishtar itself. The casting of Adjani in that role seems self-conscious. JD: This is what reviewers couldn’t abide. But movie stars on this level can’t help but bring their pasts along with them. I like that the beauty is played by a French, half-Algerian woman, who does not show off her body. And that Beatty and Hoffman play their own opposites, in an artificial or affected way, and in contrast to the macho stars of the day. I appreciate the paradoxes the actors are made to embody—Charles Grodin too, as the hapless CIA agent. I loved him in The Great Muppet Caper. JM: I’d have thought you would have disliked him in The Heartbreak Kid. JD: I started out hating The Heartbreak Kid, but it grew on me. I found myself constantly reevaluating how I felt about the characters. I was initially appalled at May’s treatment of her daughter, Jeannie Berlin, who stars in the movie. 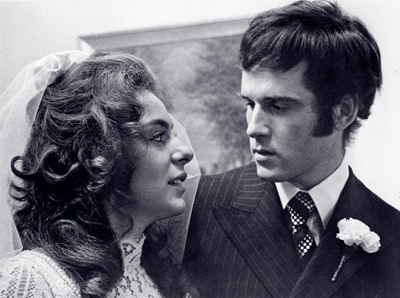 It seemed cruel: Lenny (Grodin) marries the sweet, quirky Lila (Berlin) and then deserts her, on their honeymoon, for a shiksa? It turns out the movie is an indictment of what a vapid jerk Lenny is, and upon understanding this I felt more sympathetic. Berlin’s obviously in on the joke, but her Lila is so abject (for example, the scene in which she gets egg salad all over her chin while eating a sandwich, to Lenny’s horror). But despite what a jerk Lenny is, I could identify with him too on some level. JM: Kael really likes Berlin in it. “She looks so much like Elaine May that it’s as if we’re seeing the Elaine May comic mask but with real blood coursing through her—revue acting with temperament, revue brought to voluptuous, giddy life.” (Reeling, again.) Again she criticizes “revue” comedy and early May; she thinks it’s bloodless, a “comic mask.” But she thinks something goes right in The Heartbreak Kid and moments of Ishtar. JD: I was uncomfortable with the fact that everything is seen through Lenny’s lens and not Lila’s. Our empathy with the latter is just empathy on our parts, and not the movie’s. And we have no entrance into Kelly’s—the blond coed, played by Cybill Shepherd—world. JM: She’s just an image, for us and for Lenny—maybe for herself. So tell me more about this book you’ve imagined on women in comedy. I think you mentioned it at the Rachel Harrison talk at SFMOMA. JD: I keep coming back to key figures. Lily Tomlin (who seems influenced by May), Mary Tyler Moore, Carol Burnett, Bea Arthur, Madeline Kahn, Gilda Radner: women of the 70s who employed comedy toward feminist ends. I began thinking about this a few years ago, when I saw a sculpture by Rachel Harrison called Blazing Saddles (2003) that included a photo of Lucille Ball. 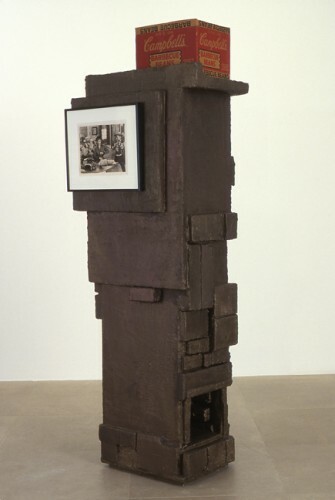 Harrison’s sculptures have an improvisational, comedic tone to them, and I started to think about this as a feminist strategy, without an overtly “didactic” (for lack of a better word) feminist message. JM: Tomlin’s feminism is overt, if not didactic. The marriage-phantasmagoria in her 1972 TV special is pure Womanhouse. May, I don’t know, though. There’s the awkward moment when she’s asked about gender in her 2006 Lincoln Center interview. JD: May is the perhaps the wrong generation for feminism: she comes of age in the 50s. What is amazing is that she was on such equal footing with Nichols—and they both deserve credit for that. It’s this moment before second wave feminism, when one might imagine that femininity, with all its tics, might simply be dropped, or turned into comedy (as they do in the doctor sketches). JD: Yes, they do seem to have an active, equal collaboration in the 50s, though I wonder why the crackup in the early 60s. It’s clear that Nichols was more visible afterward, and certainly had more of a chance to develop a directorial voice for better or worse. Her career has to be cobbled together and imagined from these inadequate representations. What if May, rather than Woody Allen, had been making dozens of movies since the 60s? They’re of the same generation, and have similar sensibilities in some ways. Yet it seems like the studio system betrayed her at almost every turn. JD: When I mentioned Nichols and May to my mother, she thought that they had been married to each other—a common misperception. It’s as if their partnership had to be normalized in some way. As for May’s relative lack of success: One cannot escape patriarchy entirely. Perhaps briefly, in a comedy sketch, but not in the institutions of Hollywood. May’s career suffered because she is a woman. As she says in the Lincoln Center interview, she wanted to appear “nice” and “pleasant,” even as she was, in her words, “just as rotten as any guy.” This imperative seems more entrenched today than ever. What if it had been her rather than Woody Allen? He’s not exactly a perfectionist. He releases good movies and bad movies, one every year. But she can’t get over the details. Or so she was portrayed. JM: She does seem to be very stringent. And yet she doesn’t always get it right. Kael has a point when she says “the element of uncertainty results in a shambles when she isn’t on top of the situation as a director.” It may be a thoroughly, magnetically weird, funny shambles, but it is a shambles. Richard Avedon, Mike Nichols and Elaine May, 1960. 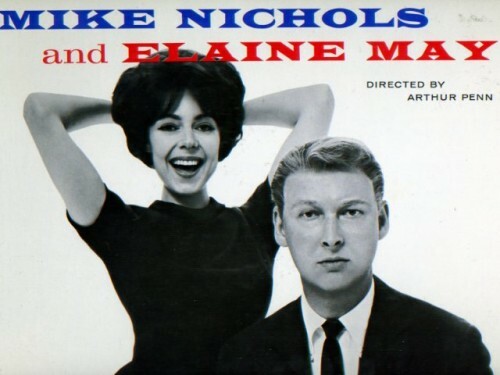 From the cover of An Evening with Mike Nichols and Elaine May, Mercury Records 1960. JD: Yeah, and that’s okay. If only she’d had the chance to get it right more often. If only we were allowed to be in shambles more, to fail more, we might all produce a body of work that has a lot of good stuff in it—even if people dismiss some of our shambles as the biggest catastrophes in movie history. JM: One thing I find fascinating about Nichols and May is that their routines don’t exactly include “jokes” in the contemporary sense. In that recording where they’re howling with laughter, I don’t hear what they find so hysterical. Yet then I laugh at a moment that seems arbitrary. As if their humor needs to build, or accumulate—like it suddenly spills over the edge of the cup. JD: I know what you mean. There is this generalized hysteria. But the idea of a young Jewish boy announcing to his parents that he is going to be a male nurse is hilarious in whatever context, and they can’t contain themselves. They are just holding it in the rest of the time. JD: I find this honest. It’s the random things in life that stand out, the existential absurdity. And yes, it’s all potentially funny, or else tragic. JM: I have to ask: how did it feel to screen Blazing Saddles at SFMOMA? JD: I think that film is radical. But it was Rachel Harrison’s work that got me thinking about how funny art can be. We look for comedy in the movies, but not usually in art. Harrison courts the crass and the abject, along with what is usually elevated. JM: The museum can be like the Academy Awards: worthy, over-substantiated, over-serious. Art can be very funny but we often deny this obvious fact. I remember a dinner where I was earnestly trying to convince Lynne Cooke that she needed to watch Anchorman or risk irrelevance. JD: Will Ferrell is great. So did you convince her? JM: Are you kidding? No. She was impervious. Probably the best and most insightful discussion of Ishtar I’ve ever seen.